A daily dose of inspiration & motivation for the busy holiday season. 100 Days to Christmas. . .the Countdown Begins Today! A Daily Dose of Inspiration & Motivation for a Busy Holiday Season! It is all you need to make this your best holiday season yet! eBook buyers will get a code for 25% off an annual membership to ListPlanIt.com! Join our community for updates and the latest discussions at our 100 Days to Christmas Facebook page! 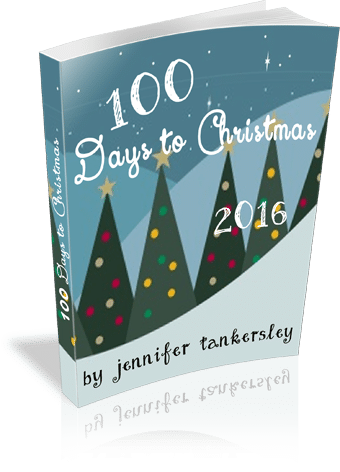 100 Days to Christmas 2016 Now Available! Download it today for just $8 $5! eBook buyers will get a code for 25% off an annual membership to ListPlanIt.com! For an excerpt of the first 8 pages, including the table of contents, instructions for using this eBook, and Day #1, see below. Today marks 4 months to Christmas. The most wonderful time of the year is around the corner. Are you ready? You can be with the 100 Days to Christmas 2016 eBook. Over 100 pages + 34 lists and worksheets from ListPlanIt.com. It covers planning for all of the fall holidays, gifts, cards, food, family, home, decorations, crafts, and more in a simple, step-by-step, day-by-day format. Available Tuesday, September 6. 100 Days to Christmas is not just about planning for Christmas each and every day. That would get old and would be overwhelming. The idea is, however, that by starting early in thinking about tasks, you’ll start earlier in your planning. By starting in September, we are able to take it slow and incorporate the many holidays and special occasions that occur during the holiday season. While you may not feel motivated to buy gift wrap in October, just seeing it mentioned may be enough to jumpstart your brain into having it ready for Christmas. Here are some reasons why you should join us in the journey to Christmas for 2015. Great community. There is a terrific group of people who follow along and participate on the 100 Days to Christmas Facebook page. People ask questions, submit ideas, share photos. This year it will be even greater! More to come on that. Fun giveaways. In years past, we’ve had some great giveaways for people following along. This year, we will be giving away annual memberships to ListPlanIt.com, 100 Days to Christmas Binder, some of my favorites: music, books, gift cards, and some surprises. Motivation = Action. As you follow along, you’ll find that the tips, reminders, and activities suggested will rouse you into action. You might find that you’re buying ingredients well before Thanksgiving instead of last-minute or getting your family photo taken in time to send it out in your cards. Party time. We like to kick off the 100 Days to Christmas (September 16) with a party! All you have to do is join us on Facebook at 9 pm EST, and we will inspire each other. More to come on that. By the Book. 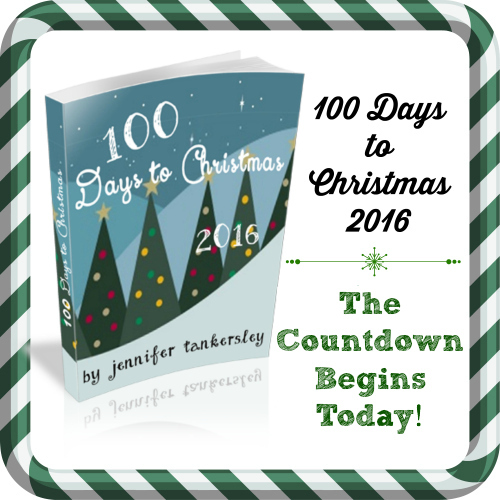 The 100 Days to christmas 2015 eBook has it all laid out in one convenient packet. There is a calendar synopsis of everyday, a page dedicated to a new task each day, resources and tools included, and buyers get a coupon code for 25% off an annual membership to ListPlanIt.com. Plus, brand new this year is a Countdown Checklist that allows you to check off tasks as you go. But hurry up because the book is only available to buy until Friday September 19! Lists Galore. With 34 lists & planning pages included as a companion workbook in the back of the eBook, you have just about everything you need to organize your holiday thoughts. These can be printed or you can type right into the PDF. I look forward to the journey with you this year! Download the eBook now for just $8 OR click here to find out how to get 50% off the eBook. For an excerpt of the first 8 pages, including the table of contents, instructions for using this eBook, and Day #1, see below. I know it seems hard to believe, but today we are officially halfway to Christmas! Yay!! 100 Days to Christmas will be gearing up soon with a brand new 100 Days to Christmas 2015 eBook to be released at the end of August and beginning the countdown on September 16 (exactly 100 days to Christmas) so be on the lookout for more information coming soon. Stay up to date on news and information about this year’s 100 Days by joining our Facebook community. To get started saving money, preparing for summer holidays, or getting ready extra-early for Christmas, check out ListPlanIt.com for hundreds of printable lists and planning pages to put your world in order! Pro Members to ListPlanIt will get the 100 Days to Christmas for FREE in the month of September, so join today! 100 Days to Christmas 2014 eBook Now Available! for a Busy Holiday Season! Download now for just $8 OR click here to find out how to get 25% off the eBook.